I've been going to a lot of expensive restaurants. It takes a few splurges to get me through the Prague winter and other dark things going on lately. Don't get me wrong. I eat plenty of cheap stuff, too. I'm the guy who reviewed the sausages on Wenceslas Square and lived to tell the tale. I'm the guy who writes about the burgers. I love an inexpensive and tasty meal as much or more than anyone. 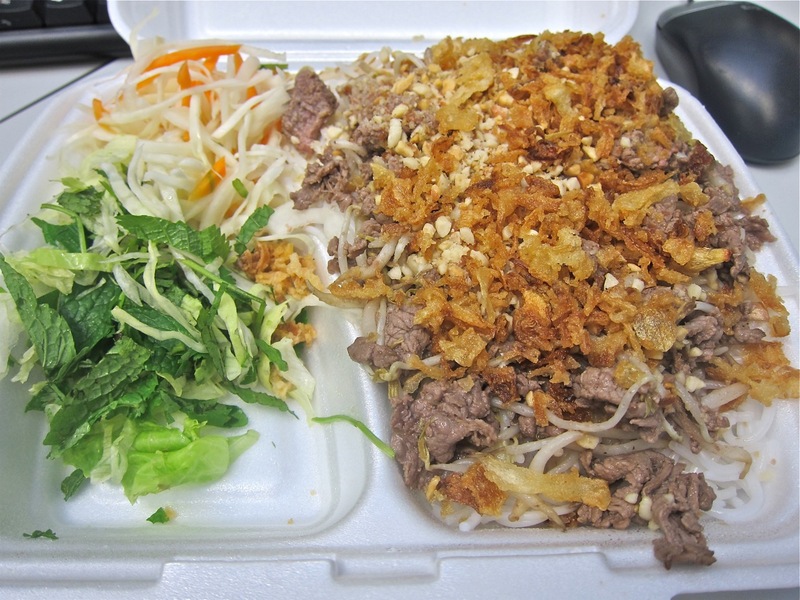 So the lines out the door at the little Vietnamese spot, Tuan & Lan Pho Vietnam, did not escape my notice. OK, there weren't any on this day, but it's pretty common. In summer, they also have extra tables outside. The couple Tran Anh Tuan a Giap Thi Lan opened the eatery near the Jiřího z Poděbrad metro stop in the summer of 2011. 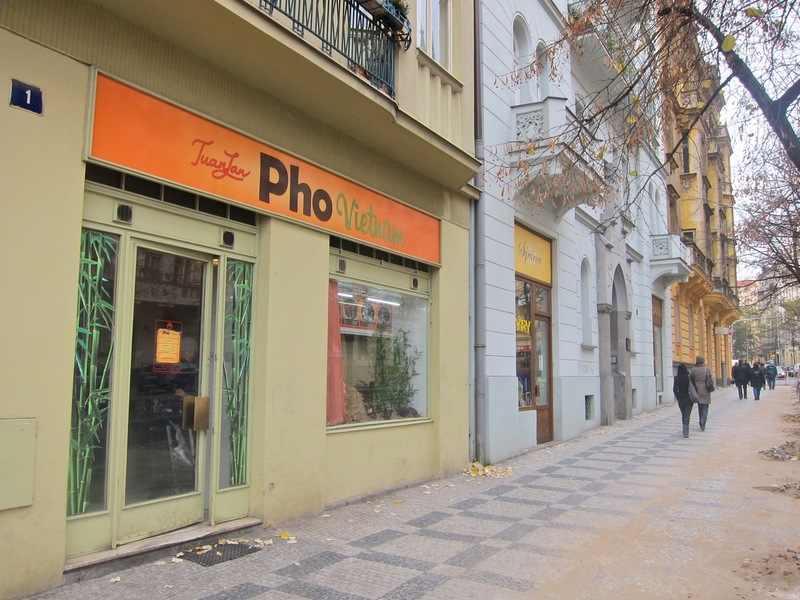 A write up in a Czech newspaper said they ran restaurants in Vietnam and only came to the Czech Republic in 2008. They don't have full restaurant permits, so it's basically a take out place with a few tables where you can stand and eat. It's cramped and not comfortable, but plenty of people do it each and every day. Don't know what to order? 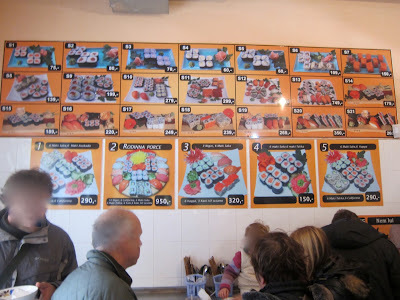 The menu is on the walls with pictures and descriptions in Czech and English. 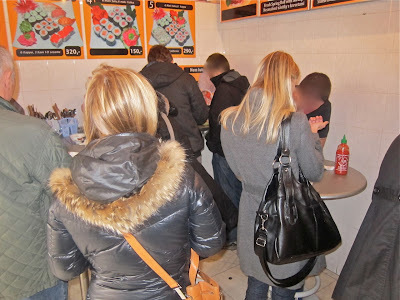 They even do sushi, but I didn't try any of that. 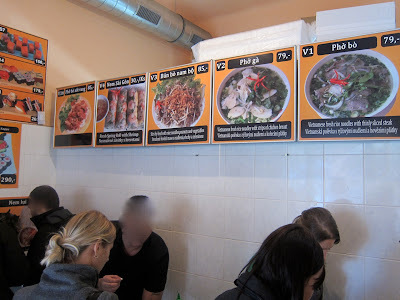 What I did try first was the Bún Bò Nam Bộ (85 CZK). This was one of my favorites. The first time I had it, the beef was tender, but the second time, it was chewier. 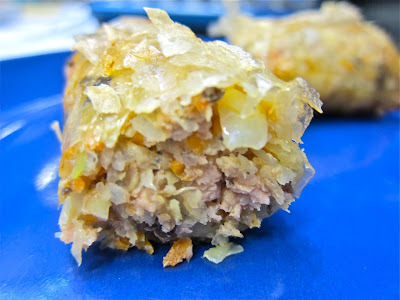 It's topped with fried onion bits and chopped peanuts. The meat sits on plain rice noodles. On the side is mint, coriander, lettuce and pickled cabbage and carrot. I got less mint and coriander the second time.It was served with a thin, spicy, garlicky chili sauce. You can also grab free lemon or lime from the counter. I suggest you do. The noodles are pretty bland by themselves, but a shot of chili sauce and maybe some lemon cures that. The key for me was to mix everything together, especially the pickled stuff. With each fork, there was so much going on -- sweet, salty, sour, meaty, crunchy. The portion was large so I ate half for lunch and half for dinner. 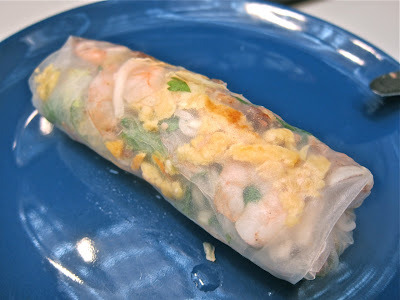 Then I tried the fresh (unfried) spring rolls. 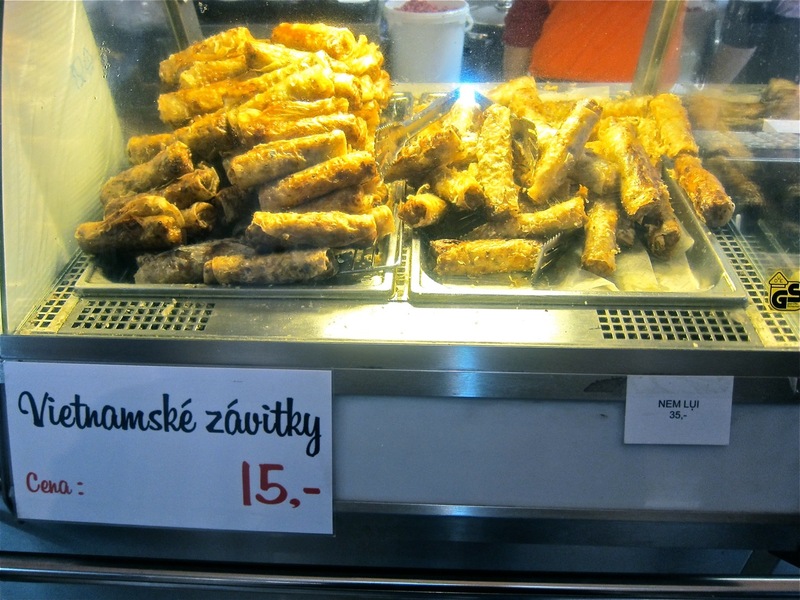 The best for me was the shrimp, pork, and egg (30 CZK). The pork had amazing flavors. 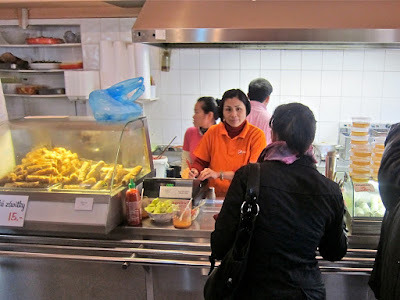 I asked the woman behind the counter what spices the used, but she would only smile and say "special Vietnamese spice." 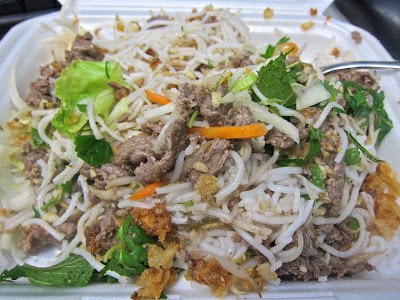 There's coriander/cilantro in there and the rice noodles. 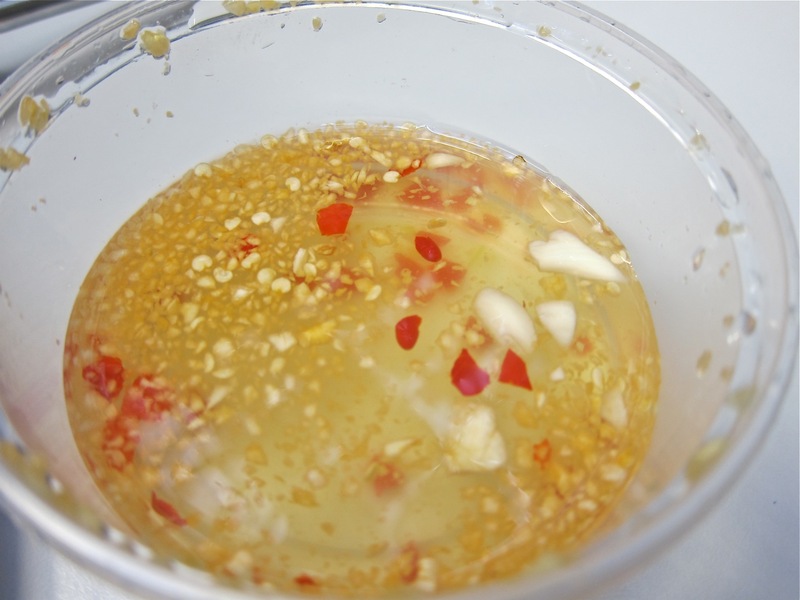 I liked them all better with a dip in the chili sauce. I got the beef spring roll (30 CZK). 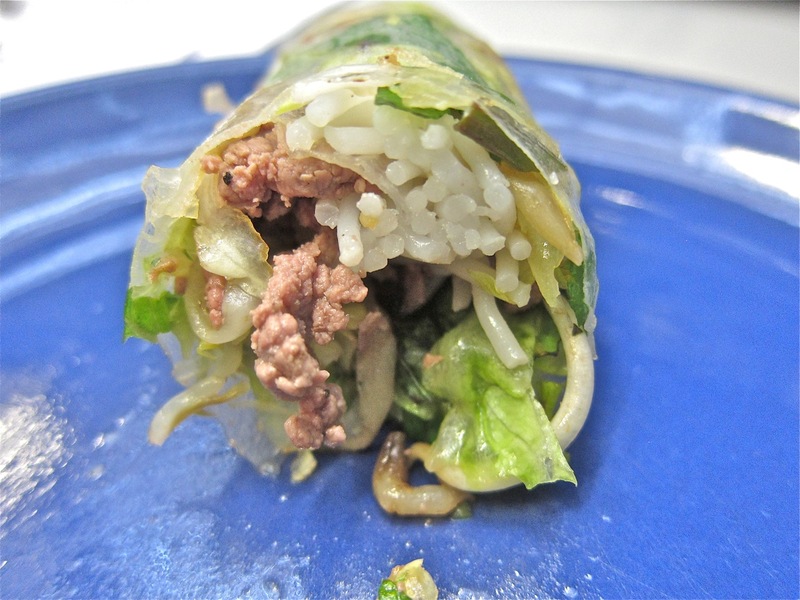 That was fine, and it included meat, noodles, mint and lettuce, but it was not as interesting as the first roll. There was not as much going on inside. The fried pork spring roll was good (15 CZK). It's big -- almost a meal by itself. The very fresh meat was ground up, mixed with veggies and held in a delicate wrapping. They are best when served piping hot and crunchy, straight out of the fryer. Unfortunately, they make them in big batches. After they cool down a bit, they start to get chewy. 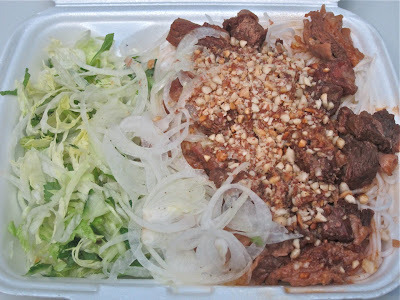 On another visit, I got the Phở bò sốt vang (85 CZK). The beef was in bigger chunks than the first dish, and it was slow-cooked to softness, with a tomato-based sauce. It was served over plain rice noodles with ground nuts on top, and fresh onion, lettuce, mint and coriander on the side. 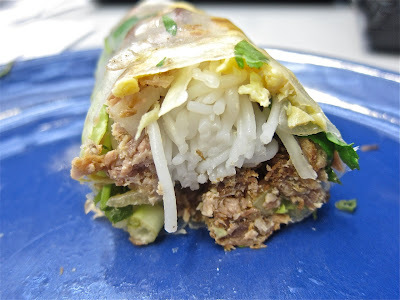 It was OK, but in my opinion, not nearly as nice as the Bún Bò Nam Bộ. 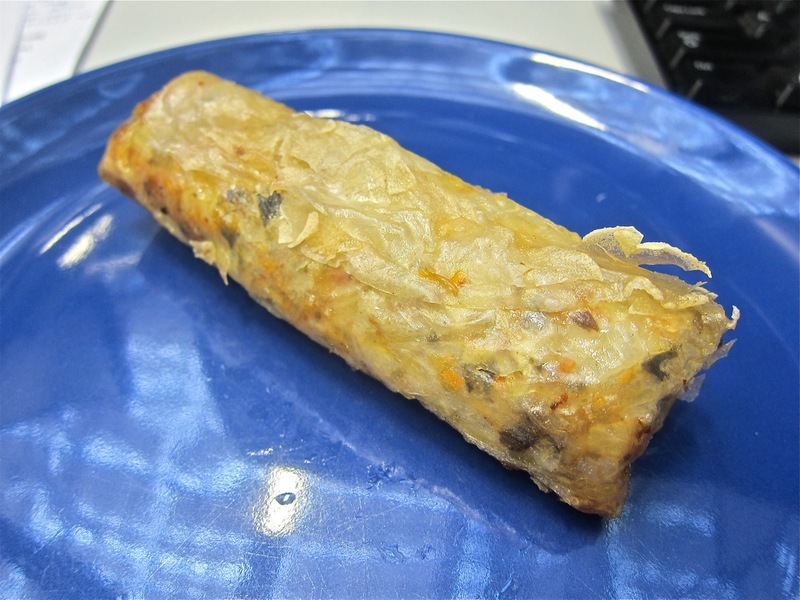 I got an order of nem lui to take with me (35 CZK). In simple terms, it's fried pork/beef burgers on a stick. There was a hint of seasoning, but I thought them relatively boring. 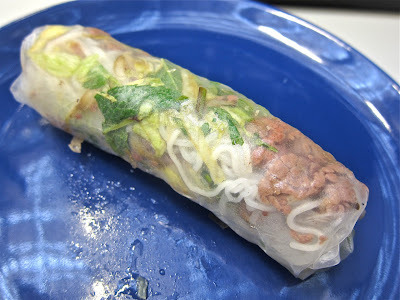 Nem lui are often made with hoisin sauce and fish sauce and threaded onto lemongrass stalks, but I didn't taste much going on. They were very greasy and really didn't travel well. When they are not hot, they are not good. 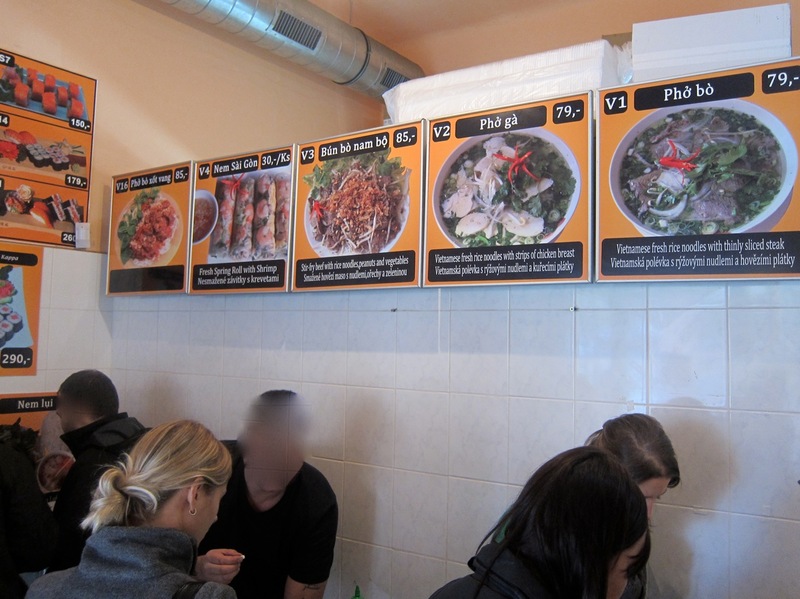 Finally, I had the classic Vietnamese soup, pho bo (79 CZK). 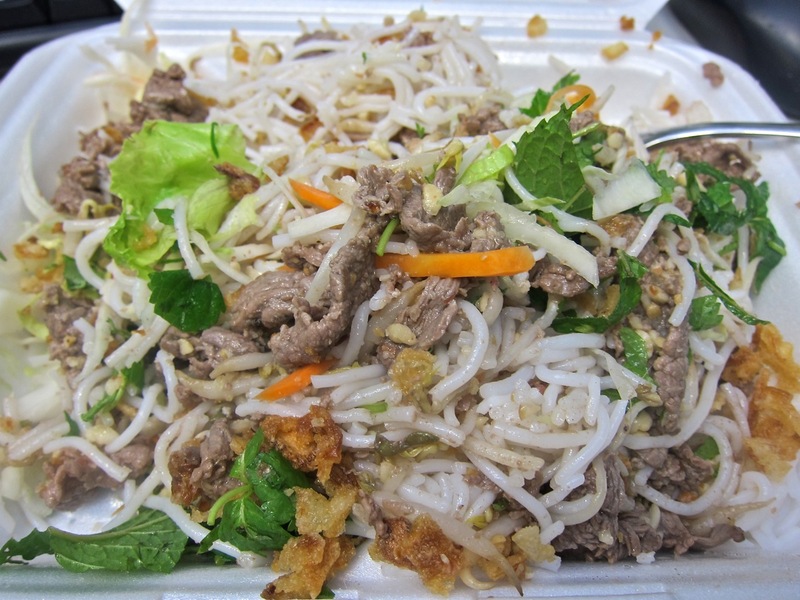 The beef was certainly tender, and there were lots of noodles and greens in there. But I was disappointed by the blandness of this particular batch. I told friends I thought it really needed more lime and coriander. They told me they didn't have such problems, so your experience may vary. While I would knock Pho Vietnam Tuan & Lan for a lack of consistency, I would also applaud them for value and quality when they get it right. I would spend around 150 CZK and walk out with enough food for two meals. I found more pleasures there than in many more expensive restaurants, so I'll be back. As I discovered, the more I ate, the richer I got. 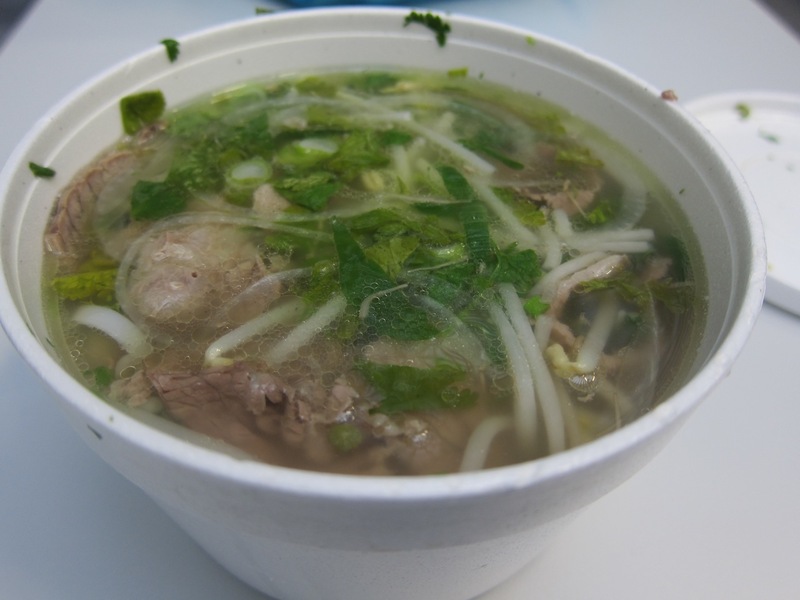 I love Pho Vietnam, i can say I am addicted to their unfried rolls, bum bo nam bo, pho bo. Every time I tried I was satisfied. They can be better - they can be closer to my home ;) and have tables with chairs. hi from HCMC. the food you're eating at Tuan and Lan's place is northern Vietnamese cuisine which is considered to be not nearly as tasty as the grub in the south. I've lived in both Hanoi and here and generally agree with the sentiment, tho there are obviously exceptions. 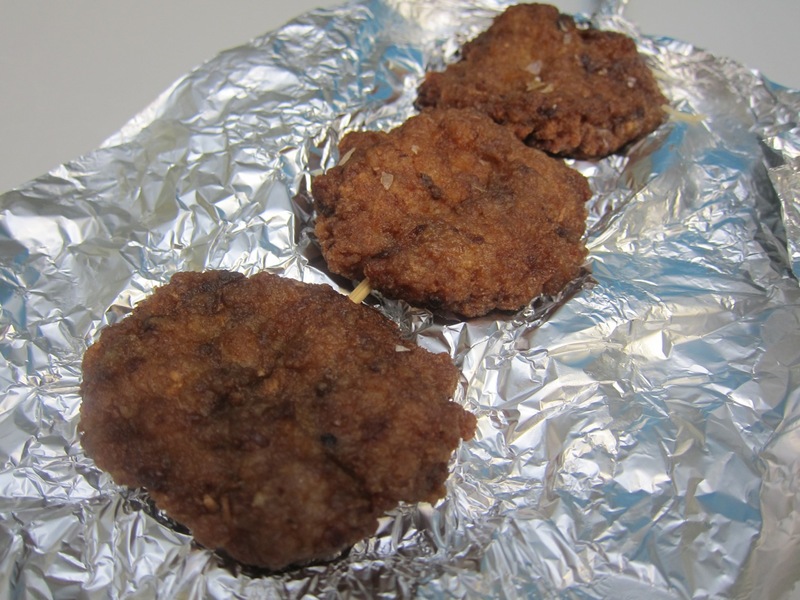 also, they know better than to fry a batch of zavitky every hour or two and sell them as fresh - that's sheer laziness at its worst. Hey, thanks for the review. You also can try one Vietnamese eatery near Albertov tram stop- I'm not sure what's the exact name, but it's easy to spot. I've tried both- and the one in Albertov is way better. now this looks like the owners are doing the work... or at least, is not ur usual launder rest. .... great to know is near Jiriho.